In the last update I didn't go over Eloise's six month pediatric checkup because the appointment was for a couple days after the update so before we get started I am just going to touch base with that. 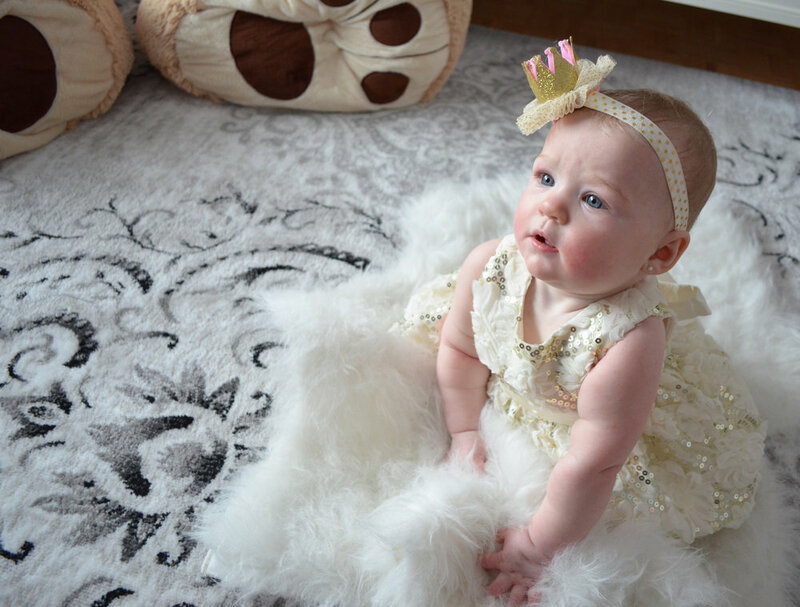 Her appointment went well and as predicted Eloise is ahead of her developmental milestones. The pediatrician told me it looks like she was just getting over the flu when she took a look inside her ears. I was taken back because Eloise hadn't shown any signs of discomfort. She never had a fever and her sleeping habits were normal. Eloise did have a bit of the sniffles but she recovered quickly. She is pretty much always happy and the only time I see her get a little but cranky is when she is tired but other than that she seems unbothered by her teething or evidently, by the flu. 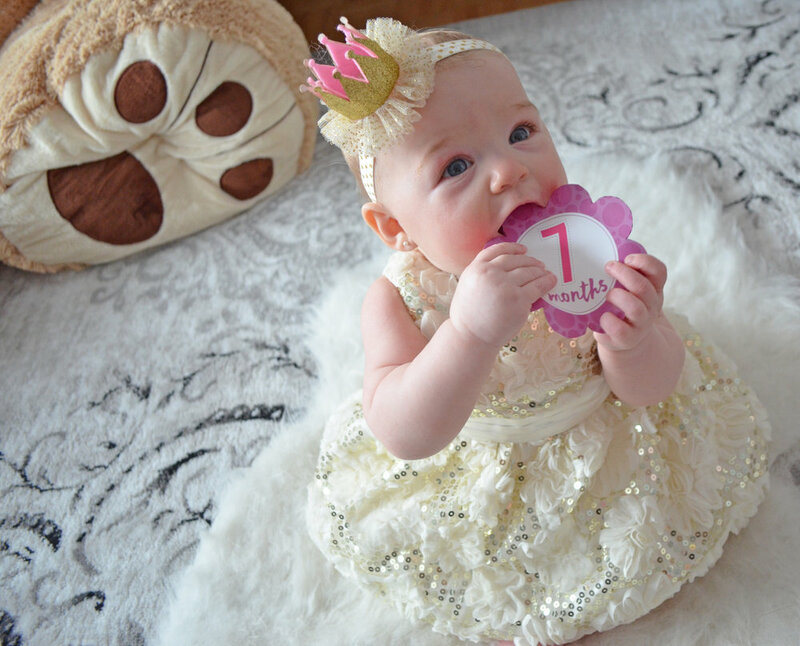 She had her six month vaccine and didn't cry! She is an incredibly strong little girl, that is for sure. Speaking of teething, Eloise now has 4 teeth! Two on the bottom and two on the top. She actually enjoys when I brush her teeth. I make sure to softly massage her gums as well, which she loves. Her cheeks have been getting a little red from her teeth coming in but she still seems to be in her usual happy mood. Eloise will go from sitting position to her tummy and pivot herself around or scoot backwards. If she is sitting in front of something she will lean forward to try to pull herself up! She gets to her knees then needs assistance as she LOVES to stand. I will try to sit her in my lap and she will just stick out her legs like she wants to stand as she prefers it over sitting. She is curious about everything and anything. She is intuitive. She is extremely interactive with her toys. Currently she is really enjoying the push walker toy that lights up and sings. It has a little telephone on it that she is absolutely OBSESSED with. She loves anything that makes crinkly noises. If I put music on she will usually wiggle her body like she is dancing, whether she is laying sitting or standing up, she has some killer dance moves. She gets embarrassed when she poops. It's the cutest thing! When we ask her "Did you poop?" she just looks at us giggling and smiling. When visiting family for Christmas, I forgot her infant bathtub at my dads who lives pretty far from me, so we began bathing her in our bathtub. We lay a towel down and roll one end of it to create a little pillow. Then after she is all clean we will sit her up so she can play. She loves bath time even more now! So much more water to splash around. She gets water everywhere! She is slowly taking on solids. Sometimes she's interested and sometimes she's not. So far she has tried, avocado, banana, rice cereal, oatmeal, carrot, sweet potato and applesauce. I make all her purees at home except if I am traveling I will pick up some organic apple sauce. My breastmilk is still her main source of food as it should be. 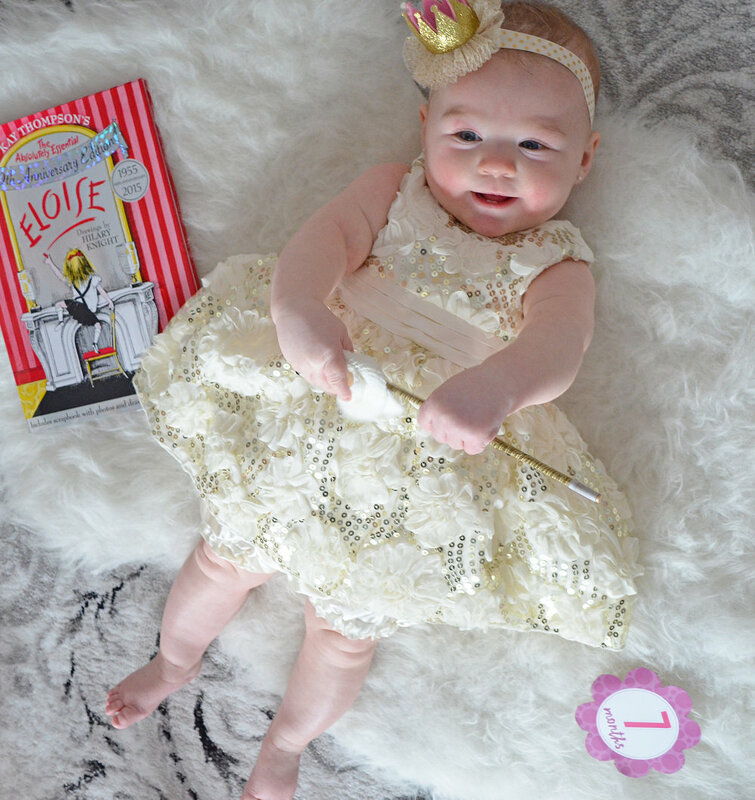 Watching Belle Eloise grow and discover new things as it makes our hearts melt. We love and adore her so much! She is just so full of personality and it's so interesting watching it come out more and more every single day. Below you will find her 7 month photoshoot. All I have to say is, thank goodness my husband was there to help keep her distracted so I can snap some great photos haha. She is always on the move!